I’m not sure when it started, but sometime after my husband and I were married, my mother came for Christmas and brought us a panettone for breakfast. Ever since then, this rich, sweet Italian bread has been a part of our Christmas breakfast (along with bagels with cream cheese and smoked salmon). Last year, I decided to try making my own. And now it’s that time of year again! 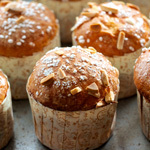 Panettone is not a bread for the faint of heart. Note I did not say it’s not a bread for beginners, because I believe even those relatively new to bread baking, as I was last year, can have fun and achieve delicious results with this. But make no mistake, it is tricky, and it does require an investment of time and money that not everyone will wish to spend. And I have rather a lot to say about it, so if you want to keep reading, better grab a cup of coffee and settle in. I made three batches last year, each better than the one before, and I was pretty pleased. But the bread still was not quite as light and shreddy as I would have liked. Since then I have had the wonderful opportunity to make panettone in a couple of courses at SFBI, which helped me better understand not only how the bread should be made, but how the dough should feel and handle. 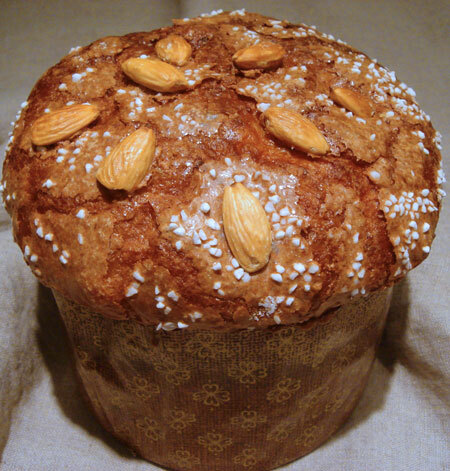 As a result, this year’s home-baked panettone (at least this first batch of it) is much closer to my ideal. I know it’s not an option for everyone, but if you have the chance to take a class or visit a bakery and put your hands in the dough, I highly recommend it! 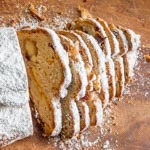 My panettone is adapted from the one I learned in SFBI’s Viennoiserie workshop. The original recipe calls for Italian starter, which is supposed to be kept at 85F and fed every four hours for at least a few days prior to using it. This creates a starter with low acidity that works well for sweet breads. Well. My vacation time is pretty much spoken for, and I don’t think my boss would count babysitting a lump of flour and water, even in the interest of a lovely bread that he is bound to receive some of, as enough of an emergency to warrant a leave of absence from work. So I compromised. I converted a portion of my liquid starter to a stiff one (50% hydration), and fed it every 12 hours for a few days, keeping it at room temperature. Then, starting early on the first day of the 2-day baking process, I fed it three times at 4-hour intervals, maintaining it at around 85F. To ferment the starter, as well as for the final proofing of the panettone at 80F, I placed the dough in the oven with a cup of warm water and a room thermometer. I cracked the oven door open if it got too warm, and reheated the water as needed. When I said “babysitting” I wasn’t kidding. Just like having a newborn in the house again. I think I am way too obsessive about these things. In addition to the starter, the recipe uses a small amount of yeast. SAF Gold is a special (“osmotolerant”) instant yeast that is especially good for sweet doughs (sugar impedes fermentation when present in high amounts). If you don’t have SAF Gold, you can use regular instant yeast. The recipe also calls for some other ingredients you might not regularly stock in your pantry. Diastatic malt powder contains enzymes that break down starch into sugars that the wild and commercial yeast can use over the long first dough fermentation; skip it and you risk ending up with a very pale crust. Don’t confuse corn flour with cornmeal or cornstarch. You just need a tiny bit of it for the glaze; I found some in the bulk section of Whole Foods. I couldn’t find whole blanched almonds, and ended up blanching some myself. 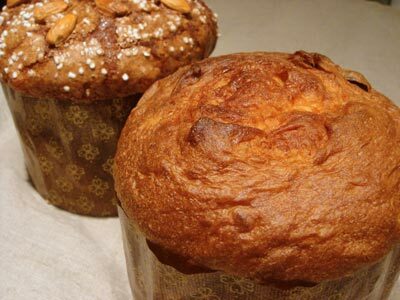 Panettone is an extremely soft, rich, sweet dough. 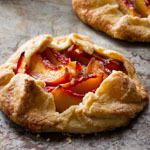 The gluten must be very well developed for the dough to be strong enough to rise high and support all that richness and added fruit. But sugar and fat interfere with gluten development, so these ingredients are withheld from the initial mixing of the final dough, and added in controlled stages. The dough, when properly mixed, yields a paper thin, very translucent “windowpane.” The total mixing time is quite long, maybe up to 20 minutes or even more; it will depend on your mixer. Paper panettone molds are available seasonally in many kitchenwares stores, in a variety of sizes. This recipe calls for 5.25-inch diameter molds, which cost me about $0.50 each at Sur La Table. Panettone wants to cave in on itself when it comes out of the oven. Hanging it upside-down for several hours prevents this. Some recipes tell you to pass bamboo skewers through the loaf (mold and all) after baking, from which you suspend the loaves. I found that skewering after baking takes up valuable time during which the loaves are starting to fall. I discovered I could insert the skewers through the molds (just along the bottom) before placing the dough into them, then just bake with the skewers in. 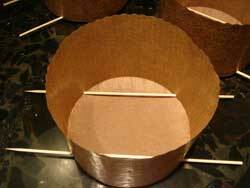 To hang the loaves, suspend two dowels between chairs for the skewers to rest on. I had to put mine upon the dining room table so the dog couldn’t get them! 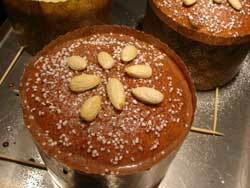 The pannetone can be glazed and garnished with almonds and pearl sugar, or not. I think the adorned ones look beautiful, but if you choose to leave it unglazed, as I did with one of mine, you can cut tuck a pat of butter into a shallow X cut in the top of the loaf just before baking. I have heard that panettone can keep for up to several weeks if wrapped well, but I already have short-term plans for this batch of three. And last year we ate one after Christmas that had kept for two weeks; while not inedible, it definitely seemed dry and past its prime. So I’ll be making more in a couple of weeks for Christmas breakfast. I’ve already got the two days blocked off on my calendar. To build the sweet starter: Mix 20 g stiff starter, 20 g flour, and 10 g water. Ferment for 4 hours at 85F. Discard all but 20 g of starter, and repeat the feeding a second time. 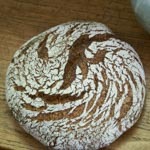 For the third feeding, start with 40 g of starter, add 40 g of flour and 20 g of water, and again ferment for 4 hours. Scale out the amount needed for the first dough. Mix all of the first dough ingredients just until combined. Place the dough in a covered, lightly oiled container and ferment for 12 hours at warm room temperature (about 72F). In the bowl of a stand mixer, combine the flour, salt, egg yolks, orange zest, vanilla seeds, first dough, and about a quarter of the water. Mix in low speed until the ingredients are just combined, about 3 minutes. 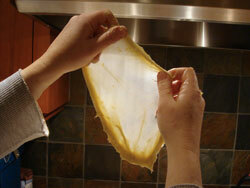 Ferment at warm room temperature for one hour, folding the dough after the first 30 minutes. Turn the dough onto a buttered surface. Divide the dough into three pieces, and form each piece into a light ball. Allow the balls to rest (may be left uncovered) for 20 minutes. Meanwhile, skewer the molds as shown above. Proof at 80F for 4 – 6 hours (or about 12 hours at room temperature), until the dough is risen to an inch or so below the top of the molds. When the dough is nearly fully proofed, preheat the oven to 350F, with the rack in the lower third of the oven. 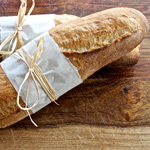 If the loaves have been proofing in the oven, make sure to remove them before preheating! Optional step: To mix the glaze, whisk all ingredients together. Pour, brush, or pipe the glaze evenly onto the top of the loaves (don’t worry if it pools where the dough meets the mold). Sift powdered sugar over the tops, then sprinkle with pearl sugar and a few whole blanched almonds. 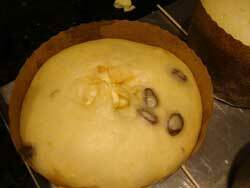 If you leave the panettone unglazed, use scissors snip an X into the top of the loaf and tuck a pat of butter inside. Place the loaves directly on the oven rack and bake for about 35 – 40 minutes, until the tops are dark brown and the internal temperature is 185F. If the tops are already quite dark after 25 – 30 minutes, turn the heat down to 325F. While the panettone is baking, set up your hanging apparatus (see above). When the bread is done, hang them as quickly as possible. Allow the panettone to hang for at least four hours, up to overnight. Panettone I baked for Easter came out great, I couldn’t believe my eyes I made it, Thank you so much for the great explanation and also for your starter recipe, I followed it exactly as you suggested and I am really proud of my results. What is the long recipe? I want to try it the long traditional way. Would it perhaps work to make Panettone Pretzels? 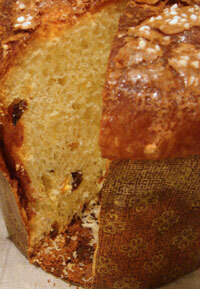 I’ve tried several panettone recipes with fair to good (but not great) results. 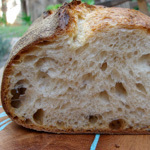 All of the methods instruct you to develop the gluten by kneading the first as well as the final dough. 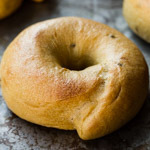 As i understand it, your recipe lets the gluten develop in the first dough only through fermentation, and through kneading and proofing with the second dough. Is that correct? 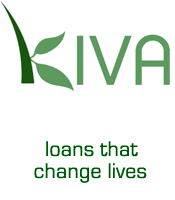 The overall look of your site iis magnificent, let alone the confent material! 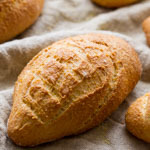 I love this bread and I have tried many recipies but they never turned out that good thank you so much for such detailed recipe I sure will try it out ,one question ? If I Am already making sourdough yeast at 12 hour feedings can I still change it to sweet dough yeast or do I have to make another batch ? I’m planning on making your recipe this week. 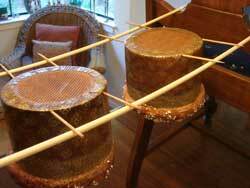 I have 6″ panettone molds. do you think these are too big for the amount of dough? Does it really make 3 loafs? Thank you!